Music for Films is a beautiful collection of fine music pieces of older film work of Eleni Karaindrou. That is the reason which does not allow a direct classification of this work. Is it jazz, is it minimalism, is it classical music? Or it is a delicate superposition of all of these different music trends? The album includes fine melodies, originally recorded to cover specific paths of film scenes. For somebody who has seen the films the music matches with the memory, the landscapes, the characters. For the others, this music creates the feeling of an un-expectable event, the picture of an unknown place; however unpredictably familiar to the memory of the listener. Karaindrou wisely composes oboe and piano, traditional greek instruments with west-come saxophone and delivers unique sounds and feelings. The presence of the composer on piano and Jan Garbarek on saxophone fortifies the strong personal character of the album. Adagio is one of the most delicate and simultaneously powerful music pieces I ever experienced. Rosa's Song (singed by Karaindrou) is a mellow track, of excellent lyrics and solid passion. 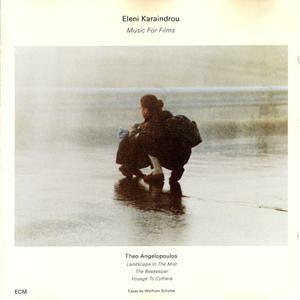 I keenly recommend this album to listeners familiar with the music of Karaidnrou and the film works presented, but also to those which are attracted by jazz and "sensible" minimalistic music. Without a doubt, this type of music is the best company for late hours or memory searching.